If you live in the Midwest like me, than you know pretty sleeveless dresses with bare legs are just not a reality on Easter. As much as I love seeing all the Spring trends and fashion come out, it’s usually COLD and raining. I’m usually bundled up in a coat with tights, or even rocking pants to keep warm. 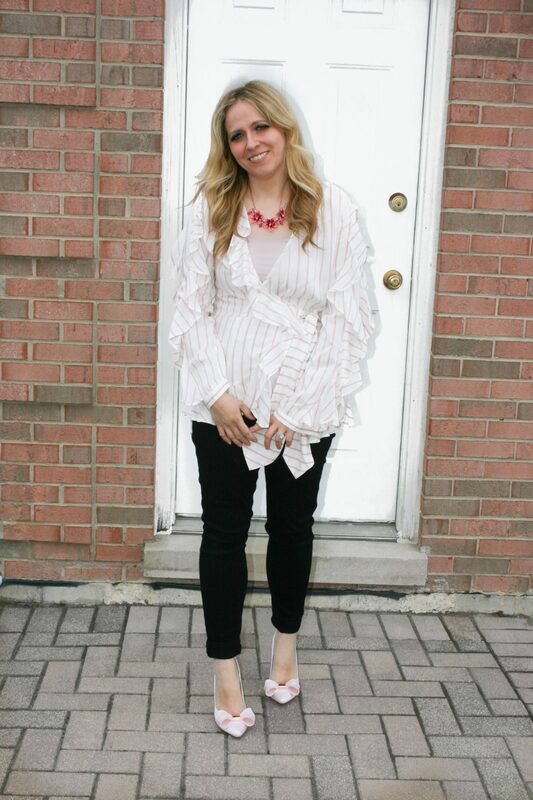 When I saw this pretty flowy top I thought it was perfect for a chilly Chicago Easter. 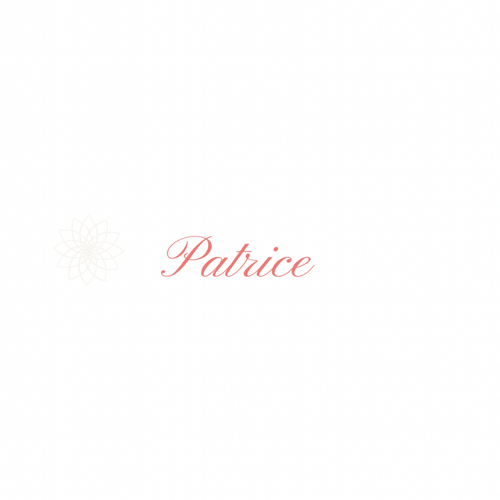 The pink color was Springy, but the long sleeves would be weather appropriate. I’m also usually chasing my little guy around so sometimes dresses are not practical. Throw on a pair of closed toe heels and I am ready to be somewhat dressed up for this Easter. 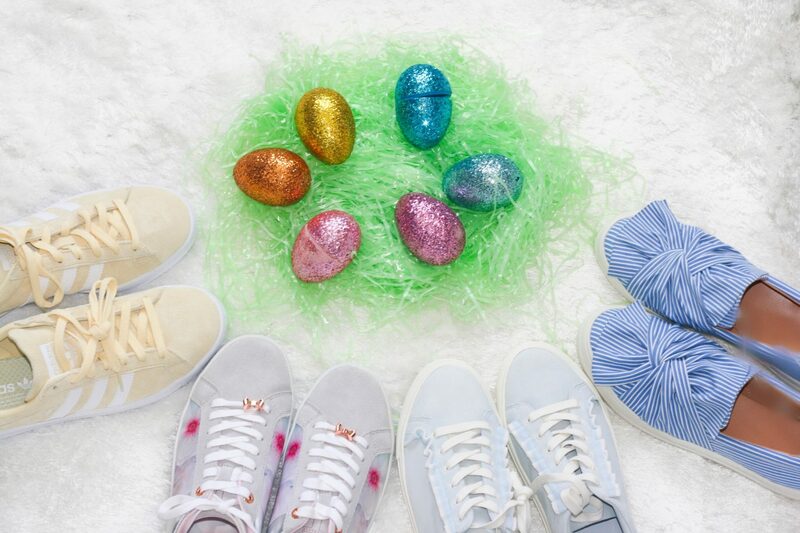 Tell me what you’re planning to wear for Easter! I love to see gift guides for holidays. It’s always fun to see ideas on what other families give to their littles. 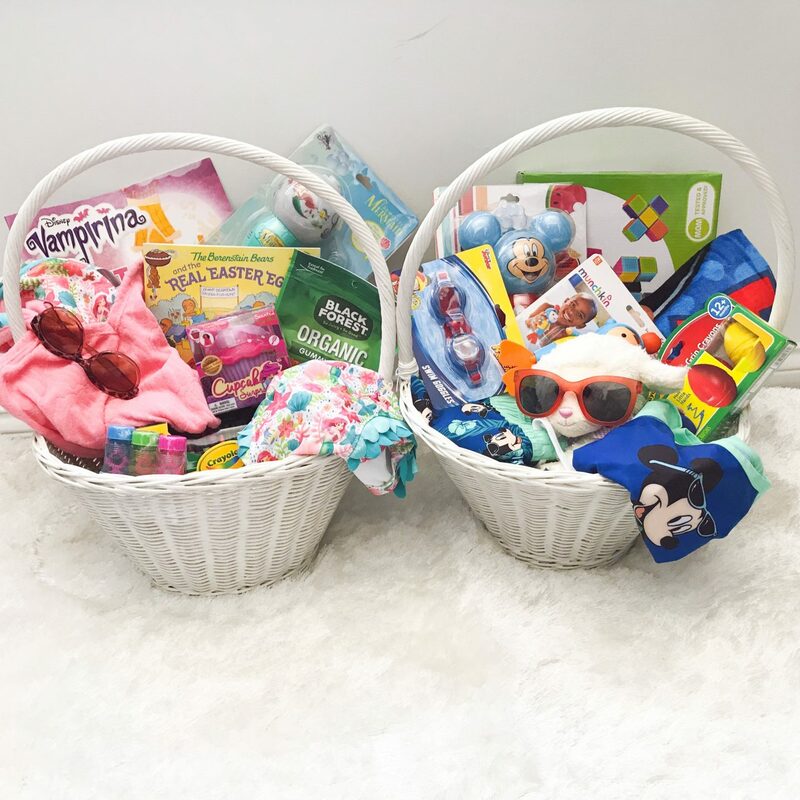 So, I’m sharing what’s in our little’s baskets 🙂 I once told a friend when she asked what I give the kids for Easter, that ‘our Easter bunny brings new swimsuits’. My daughter has an intolerance to artificial dyes, and I don’t like junky candy for the sake of their teeth, so I only give minimal candy. I like to give things that I know we will actually use in the upcoming months. Like past years, my daughter knows that in her Easter basket there will be a new swimsuit and other trinkets for outside play. It’s a little reminder that warm weather is approaching. It also reminds this mama that both kids need to be signed up for swim lessons again soon! 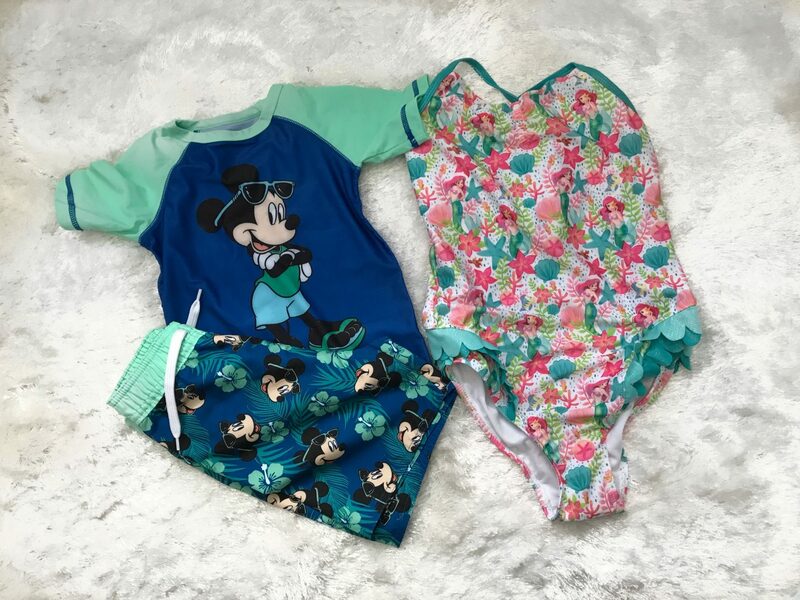 I loved getting my little man his first Mickey Mouse suit and can’t wait to see him in it . To go along with the suits, there are new sunglasses (because we always lose them each year) and pool toys. This year, while shopping for Disney swimsuits, I saw bubble wands for the summer and a bubble machine. They were adorable. I also bought my daughter a new box of crayons and coloring books (mainly to entertain her at relative’s houses that don’t have toys) and big crayons for my son who is trying so hard to color like his big sister. Leave me a comment about what you get your littles! 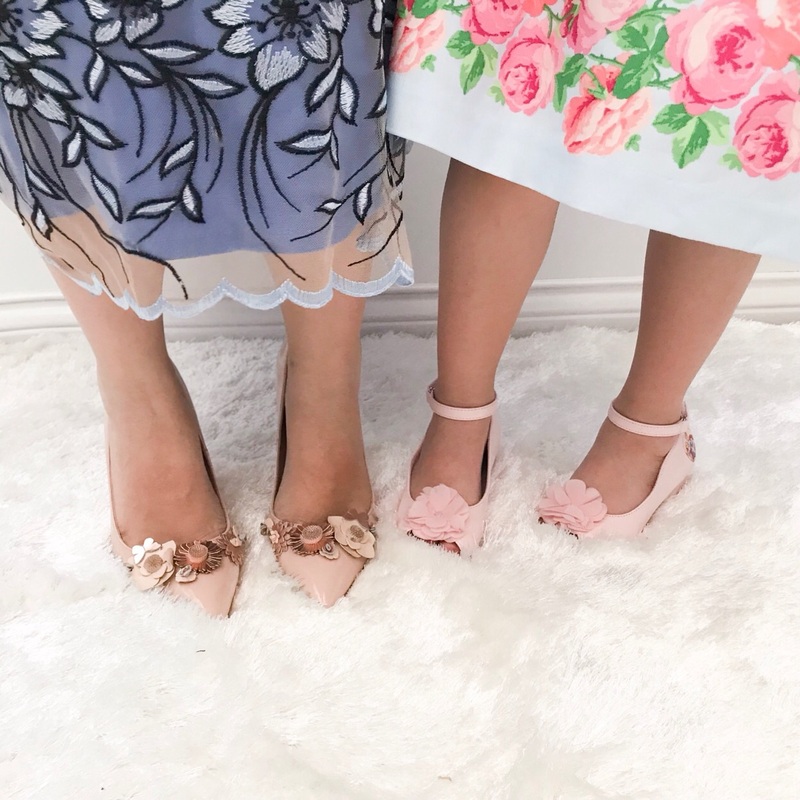 With Easter less than two weeks away I’m getting excited to see all of the pretty pastel colored fashion coming out for Spring. The snow has finally melted in Chicago (hopefully for the rest of the season) and I’m slowly stashing my boots away till next year. My flats are slowly making an appearance, as are my sneakers. With Spring comes walks to the park, zoo trips, and basically living outside after being confined for months of blizzardy winter weather. I’ve already started planning out how I’m going to lay out the backyard so we can be outside as much as possible. We are currently looking at a new swingset for my daughter’s birthday, as well as a ton of bubble machines, and sand/water tables. This year my son will be on the move too, so sneakers are a must to keep up with my kiddos. I recently came across the first Valentine’s card my husband gave me. It was tucked away in my jewelry drawer where I kept my engagement ring box. 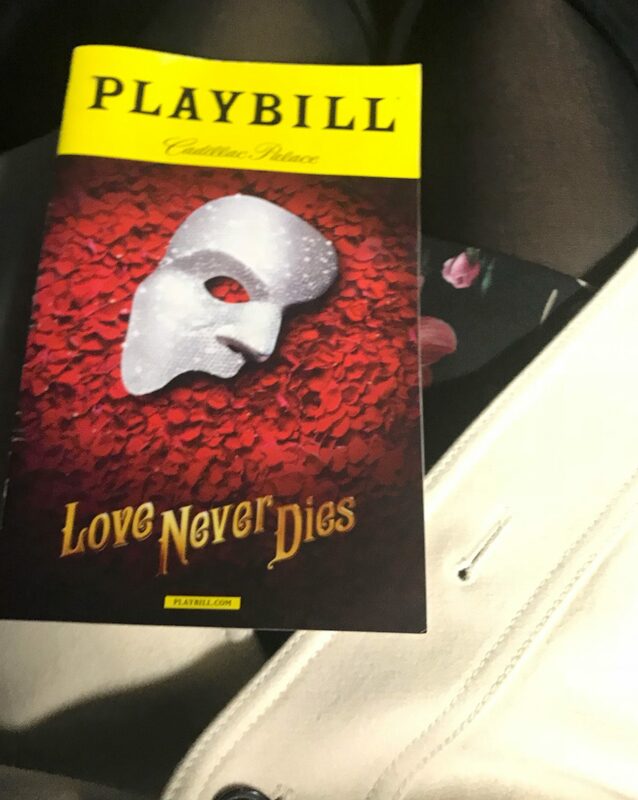 The ‘story of us’ and our Valentine’s day celebrations look a little different than they used to when my husband and I first met. 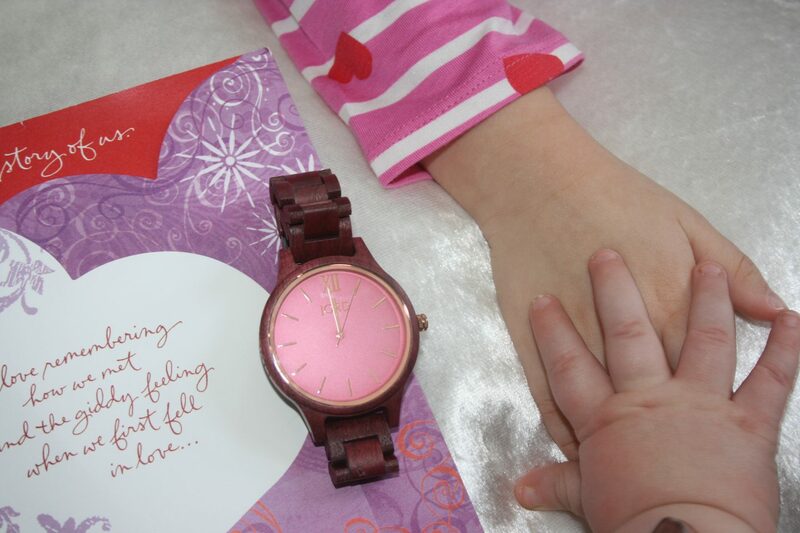 We have a little less time for us, and our Valentine’s Day celebration includes two little cuties. However, that doesn’t stop us from dressing up and celebrating this holiday as a family. 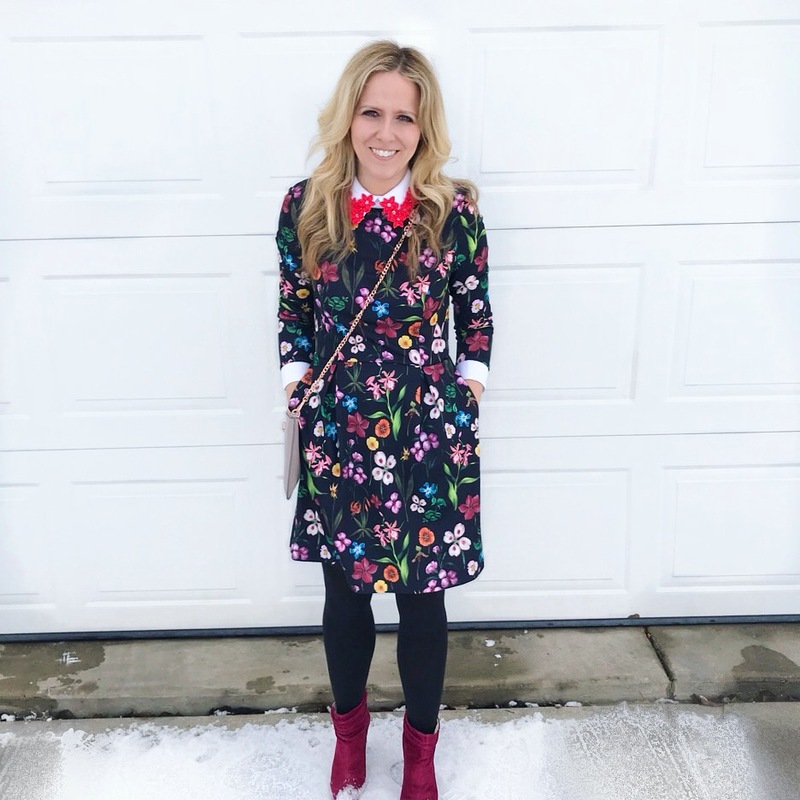 As a mom I am often searching for outfit building pieces that are kid-friendly. Chasing two children under five leaves little room for accessories that cannot withstand little hands. 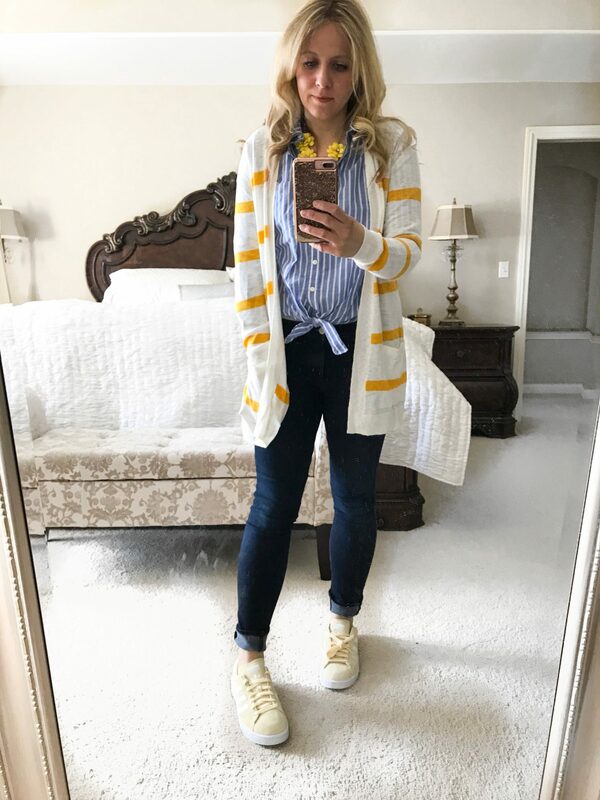 When I put an outfit together for the day I have to think about whether I will be carrying a toddler. My son is constantly pulling on new embellishments I add to my wardrobe, while my daughter is constantly borrowing them for her daily dress up initiatives. 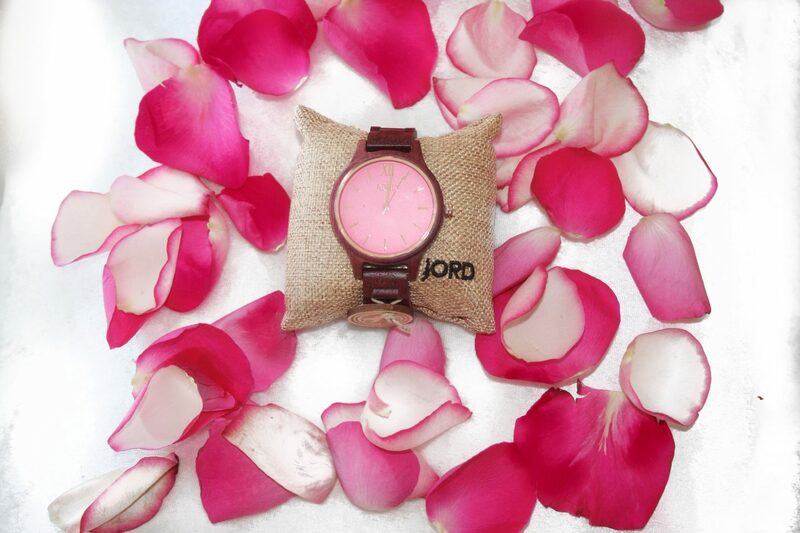 This is why I was so excited to partner with Jord Wood Watches for their Valentine’s Day campaign. Their focus is on a modern lifestyle, and they value sustainability. This is so important to this mom that still wants to look her best. The band width of the Frankie Purpleheart is 18 mm so it is very thick and the Jord company refrains from using toxic chemicals to treat the wood. The watch is also splash proof so I am never worried to wear it around my children. The Jord timepieces are also beautiful. With Valentine’s Day coming up I am so excited to add the Jord Frankie Purpleheart & Plum to my ensemble. 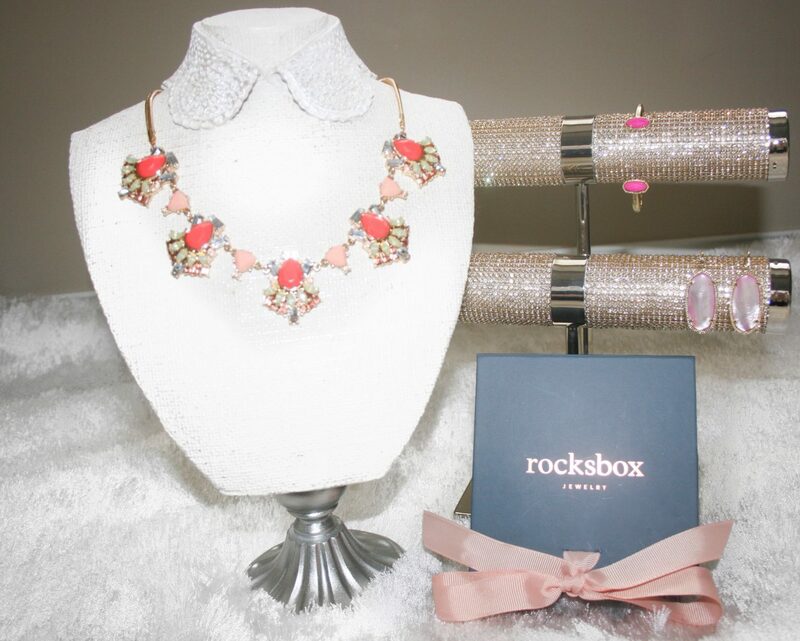 It has pretty burgundy and purple undertones with a pink face to be a perfect accessory for any Valentine’s outfit. Even if that means ordering pizza on Valentine’s Day and making heart shaped cookies with my daughter to celebrate. I also have exciting news! 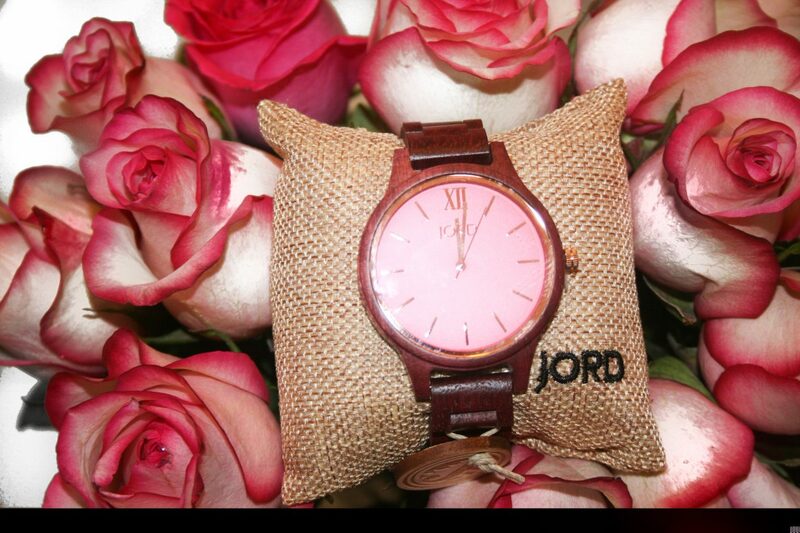 Jord watches is offering you a chance to win $100 off one of their beautiful watches so you can accessorize your Valentine’s Day outfit, or give a watch as a gift to your sweetie. Everyone that enters receives 10% off their order too! The contest ends February 18th, 2018. Good Luck! Click here for offer.